A boysenberry (Rubus ursinus) is a bluish purple-colored, juicy, and large berry that is a cross among the loganberry, Pacific berry, American dewberry, common blackberry, and European raspberry. This tangy, tart berry can be enjoyed on its own or in sauces, jellies, jams, syrups, desserts, and smoothies. Boysenberry has a variety of potential health benefits. It is considered useful for brain health, digestion, blood pressure regulation, cancer, lung health, immunity, and more. In this article, we will detail the history of boysenberry, as well as more on its taste. Boysenberry fruit is loaded with nutrition, and we’ll cover all the nutrition facts and reported boysenberry benefits. We will also include some tasty boysenberry recipes you need to try. How did the history of the boysenberry unfold? According to reports, during the 1920s, in Napa, California, horticulturist Rudolph Boysen experimented with various crosses between berries. Boysen later moved to Orange County, where he planted berry vines on his in-law’s farm in Anaheim, California. Boysen had obtained the loganberry-dewberry parent from the farm of a man named John Lubben. In 1923, Boysen’s berry hybrid was successful, but seemingly not commercially viable. Towards the end of the decade, George M. Darrow of the United States Department of Agriculture (USDA) began to trace stories of a berry grown on Boysen’s farm. Darrow had help from a farmer named Walter Knott—a known berry expert. The two found that Boysen had abandoned the idea of the boysenberry as a crop and sold his farm after breaking his back in an accident years earlier. Undaunted by this discovery, Knott and Darrow went to Boysen’s old farm and found a number of frail berry vines that had survived in a field with weeds. The vines of the boysenberry plants were transplanted and nurtured back to health at Knott’s farm. The Knott family restaurant and pie business eventually grew into Knott’s Berry Farm in Buena Park, California, due in part to the berry’s popularity. Knott is considered to be the first to commercially cultivate the berry in Southern California, and he first began selling it in 1932 at his farm stand. Knott would name the fruit after Boysen. What Does Boysenberry Taste Like? What does boysenberry taste like? The boysenberry has a uniquely rich, juicy, tart, and sweet flavor that derives from its complex ancestry. It has the wine-flavored tang and lusciousness of three native blackberry species, while the floral aroma and sweetness come from the raspberry. You will want to find boysenberries that are not bruised at farmers markets. Since reddish, under-ripe boysenberries are very tart, it is best to look for boysenberries that are darker in color. Jams, pies, and sauces will contain boysenberries that are both sweet and tart. Boysenberry fruit is loaded with nutrients, including vitamins, minerals, and some protein. The main vitamins in boysenberry are vitamin A, vitamin E, vitamin C, vitamin B1, vitamin B2, vitamin B3, vitamin B5, vitamin B6, and folate. From a mineral perspective, boysenberry contains high amounts of manganese, as well as some iron, calcium, magnesium, potassium, phosphorus, copper, and zinc. As a result of its strong nutritional content, there are many promising boysenberry benefits. For instance, the vitamin K in boysenberries may help you avoid kidney stones. Vitamin K also benefits bone strength and therefore reduces the risk of osteoporosis. The vitamin C and vitamin A content also helps prevent and treat vision-related disorders. Moreover, boysenberry is thought to be useful for diabetes, weight loss, and gallstones. Pregnant women can also benefit from its use. In this section, we will examine many other important health benefits of boysenberry. Boysenberries are very beneficial for your brain. This is due to the antioxidant anthocyanin, which could potentially protect against oxidative damage, boost memory, and prevent Alzheimer’s disease and cognitive decline. Other nutrients in boysenberry that are beneficial for brain health include folate and potassium. Potassium has been found to increase blood flow to the brain and enhance concentration, neural activity, and cognition. The vitamin B6 in boysenberry is also beneficial for those with depression. Boysenberries have long been known to treat digestive issues such as constipation. The significant amount of fiber in boysenberries helps make it easier to manage bowel movements. Like a lot of berries, boysenberry is considered great for heart health. Part of this is due to the antioxidant vitamin C content in boysenberries. It’s also due to the great potassium-sodium ratio. It contains 183 mg of potassium, compared to 1.3 mg of sodium. As a result, boysenberry may help the blood vessels relax and reduce the risk of high blood pressure. In a study published in the Journal of Nutritional Science and Vitaminology in 2014, researchers found that the polyphenolic compounds in boysenberry juice may help increase nitric oxide concentration through the aortic endothelial nitric oxide synthase activation in hypertensive rats. In other words, boysenberry may be beneficial for heart health, including lowering blood pressure. Another study from 2015 suggested that the polyphenols in boysenberry juice can help inhibit plasma triglyceride absorption levels in rats. The anti-inflammatory properties of boysenberries help boost immunity and fight and prevent different types of cancer, such as malignant esophageal and colorectal tumors. One of those beneficial nutrients in boysenberries is vitamin C, which can help the body fight against infections as well as eliminate cancer-causing free radicals. The amount of manganese in one cup of boysenberries is 0.72 mg, and this covers 36% of your recommended daily intake. Various studies have suggested that people who have seizures also have lower manganese levels. That being said, researchers are still studying whether seizures cause low manganese levels or a manganese deficiency is the cause of seizures. Lung fibrosis has a negative impact on lung function in cases of chronic asthma. One 2016 study found that boysenberry consumption supports the development of fibrolytic lung macrophages with the airway capacity to promote balanced lung repair, plus limit lung damage in chronic asthma and other pulmonary diseases. Since boysenberries spoil quickly, you will want to use them right away. The berries are excellent on their own, but they are also delicious in jams, jellies, tarts, syrups, sauces, smoothies, desserts like boysenberry pie or tart, as well as boysenberry tea. Read on as we run down a variety of delicious boysenberry recipes. For the filling: In a saucepan on low heat, add the boysenberries and cook slowly for five minutes. In a bowl, combine the gelatin, salt, and sugar. Add this sugar mixture to the saucepan, and cook for another five minutes. Stir often to avoid burning the filling. Set it aside, and let it cool. In a food processor, add the salt, flour, sugar, and butter. Mix the ingredients until they have evenly distributed. Add the water, and turn off the food processor when the dough binds. Roll the dough into a ball, and refrigerate for an hour. Roll the dough on the counter, and form dough that fits into a 10-inch pie pan. Preheat the oven to 350 degrees Fahrenheit, and bake the pie shell for five minutes. Also, roll out a pie top and cover with a towel. You will then mix an egg and water together to form an egg wash.
Place the boysenberry filling in the shell and put the dough on top, and egg wash the pie rim to seal everything together. Cut four slits in the top of the pie and then egg wash the top. Place the pie in the oven for 20 minutes until it is golden brown. Let it cool, and serve. For the jam: Boil the boysenberries, apply, and sugar for about 10 to 15 minutes. Add the lemon juice and boil for two more minutes, and bottle this jam while it is still warm. Preheat the oven to 355 degrees Fahrenheit. Cream the sugar and butter. In a separate bowl, beat the egg with the Van Der Hum. Add the egg mixture to the creamed butter and sugar. Add the baking powder and flour to form a nice and firm dough. Next, press two-thirds of the dough into a pie dish while reserving the remaining third to grate over the top of the tart. Spread the boysenberry jam in the pie dish, then coarsely grate the rest of dough on the top of the tart. Bake in the oven for about 20 minutes. Watch closely as the tart browns easily. Serve it hot or let it cool. In a medium saucepan, heat the sugar and water over medium heat, and bring to a simmer. Add the boysenberries and cook for five minutes. Remove from the heat and strain through a sieve, and press down on the berries with the back of a spoon to allow the pulp go through the sieve. Return the syrup to the pan, and add the cornstarch to the mixture. Heat until the mixture thickens and clears. The mixture will further thicken once it has cooled. Boysenberry is a hybrid cross of loganberry, European raspberry, American dewberry, Pacific berry, and common blackberry. 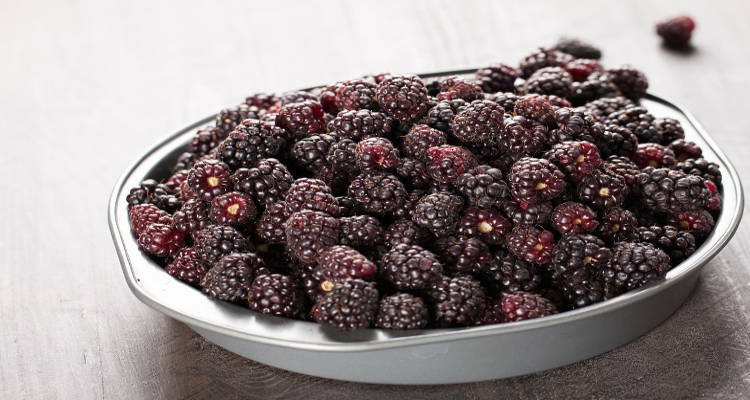 The boysenberry is known for its tangy and sweet flavor and distinctive reddish blue, dark purple color. As a result, boysenberry is excellent in jellies, jams, smoothies, and desserts. We’ve also provided some delicious recipes for syrup, tart, and boysenberry pie. The berry is loaded with nutrients such as manganese, vitamin K, and folate. And as you read through this article, we detailed the many potential boysenberry benefits. For instance, boysenberry may help regulate blood pressure and improve heart health overall; benefit digestive, brain, lung, and immune health; and also reduce your risk of epilepsy and cancer. “5 Amazing Benefits of Boysenberries,” StyleCraze, April 23, 2018; https://www.stylecraze.com/articles/amazing-benefits-of-boysenberries/#gref, last accessed July 23, 2018. Karp, D., “Boysenberry, a California treasure,” Los Angeles Times, May 27, 2010; http://articles.latimes.com/2010/may/27/food/la-fo-boysenberry-20100527, last accessed July 23, 2018 . Sterling, J., “Everything You Need to Know About Boysenberries,” Food & Wine, June 10, 2014; https://www.foodandwine.com/blogs/2014/06/10/everything-you-need-to-know-about-boysenberries, last accessed July 23, 2018. “7 Health Benefits of Boysenberries,” DoveMed; https://www.dovemed.com/healthy-living/natural-health/7-health-benefits-of-boysenberries/, last updated March 20, 2018. Mineo, S., et al., “Boysenberry Polyphenols Suppressed Elevation of Plasma Triglyceride Levels in Rats,” J-Stage, 2015; 61(4): 306-312, doi: 10.3177/jnsv.61.306. Shaw, O., et al., “Boysenberry ingestion supports fibrolytic macrophages with the capacity to ameliorate chronic lung remodeling,” AJP Lung, September 1, 2016; 311(3):L628-38; doi: 10.1152/ajplung.00309.2015. Matsushima, A., et al., “Effects of Acute and Chronic Boysenberry Intake on Blood Pressure and Endothelial Function in Spontaneous Hypertensive Rats,” Journal of Nutritional Science and Vitaminology, 2012; 60(1): 43-51, doi: 10.3177/jnsv.60.43.